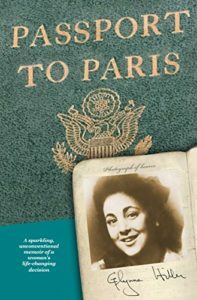 In 1950, Glynne Hiller, 26, goes to Paris with her husband, Joe, and her three-year-old daughter, Cathy, so they can all study French in the City of Light. But after a year, Glynne leaves Joe. She doesn’t love him—in fact, she questions whether she’s ever been in love—and she is looking for a more liberated life. Saucy and beautiful, Glynne charms one man after another, including the movie star Jean Gabin. Then she meets a man named Maurice and her whole understanding of love changes. Hiller, now 94, describes this transformation in the memoir Passport to Paris. She talks about her life and writing with Fiction Editor Yona Zeldis McDonough. YZM: Your father, an Egyptian Jew, moved your family from England to America in 1939; did he have a sense of what was coming? GH: My father started a cotton mill with his brother in Guatemala, before the war started. Both of my brothers volunteered to fight: Eddie, the eldest, in the RAF (Royal Air Force). Max went into the artillery force. Both survived. Meanwhile, Sally and I, separately, came to America. I came alone, and on the second night, we all came on deck were told we mustn’t make a single sound because there was a German U-boat in the vicinity. And everybody, even the children, were absolutely mum. We all cooperated. And they were already unloading the little lifeboats boats. It was very scary, I have to tell you. When I got here, I hated America! First of all, everyone would imitate my English accent. If I went into a store and asked for half a pound of butter, they would all gather round and ask, “How did you say ‘burrer’?” And some other one would say, “Say ‘half’ again” and snicker. I missed my best friend Sylvia, and there were no sports for me to play. At sixteen in England, I played hockey, lacrosse, netball, cricket, and tennis. Every single day we played an hour during the school day. And after school, since I was on these teams, I played even more. YZM: Did many of your relatives perish in the war? GH: My oldest sister Lulu had married a French Jew, and many of their relatives were tortured and killed. Victor and Lulu and their two children escaped the Nazis by the skin of their teeth and came to America. YZM: This memoir is a meditation on different aspects of love, but it’s also a love letter to Paris; care to comment? GH: I loved Paris then, I love it still — who doesn’t? After Manchester, it was an exquisite city. All the bridges, all the squares, all the buildings, there was beauty wherever you turned. The French people were much more animated than those I was used to. And they seemed to enjoy life much more than the English! YZM: Joe was Jewish and a Communist; can you talk about the connection? GH: Joe believed in equality for all, very much so. At the time, many Jews were Communists because the Communists believed in the equality of all people, blacks and women too. This is related to the Jewish notion of tikkun olam. In our political club, at least half the members were Jewish. YZM: You describe how hurt you felt when exposed to one man in your life, Ned’s, casual anti-Semitism (he says of his mother, “I mean she’s never met a Jew in her life, let alone an English Egyptian one”). Was that sort of remark common? GH: That sort of remark was not common in my world. I grew up in a more cosmopolitan society. I was surprised to hear she had never met a Jewish person. When I came to America, we moved to the Syrian Jewish community of Brooklyn, near Ocean Parkway. So most of my new friends and boyfriends were Jewish and I didn’t encounter much anti-Semitism. YZM: Tell us more about Theo, the man who raped you, yet who you write also aroused your sympathy. GH: Theo was an odd person. He was very serious and he didn’t smile much. He was studying to be a doctor and took care of me and Cathy and our landlady, Mme Doucet, without charge. He would be reading a book and trying to explain it to me and would burst out laughing. And then become serious again. Theo deserved sympathy because in the concentration camps he had seen his parents shot before his eyes. However, after he attacked me, I wanted to have nothing more to do with him. YZM: Was Maurice, the man who truly had your heart, Jewish? GH: He was only half Jewish, but he had the whole of my heart. Like many Jewish people, he had a fine mind and a quick sense of humor, and he liked to pun – in French, not in his fractured English.